What do you call a blog that offers you inspirational sewing tips, beautiful fashion posts and fun DIY projects… all fit to a doll’s size? Well, the DressYourDoll blog of course! DressYourDoll wishes you all lovely festivities and a stellar new year! Thank you for being such awesome fans! We bet your doll is still looking for a stylish, eye-catching outfit for this year's holidays! Fear not: For the whole month of December, DressYourDoll holds an awesome sale on all evening dresses! To top it off, shipping is free for all orders above €75! Just enter the code "HolidayDiscount2015" at checkout! We're proud to present our newest video, where we mix 'n match like we've never mixed 'n matched before! Which crazy fashion combo's can YOU think of? Post your style creation on our Facebook page! The new school year has started all over the world, and sewing up some DressYourDoll is the perfect way to get creative, unwind after a long day of class, or make together with your friends! For our awesome fans, we have designed an exclusive, LIMITED EDITION outfit set, so your dolls can start their new school year looking as good as you do! This outfit is a super-awesome dress with short sleeves (perfect for a early fall day!) with a particularly stellar-looking science cat print! To top it off, a retro school bag is included so your doll can carry all her A+ tests and spelling bee prizes home! THIS OUTFIT IS TOTALLY FREEEEEE!!!! FOR THE WHOLE MONTH OF SEPTEMBER. Better hurry though, because these limited edition babies won't be in stock for long! Even more awesomeness can be found in our webshop: we put a few of our classics ON SALE!! Check out our SHOP to discover which outfits you can buy for only €6.50!! Happy Earth Day: how to make a Kimono! Happy Earth Day to you all! 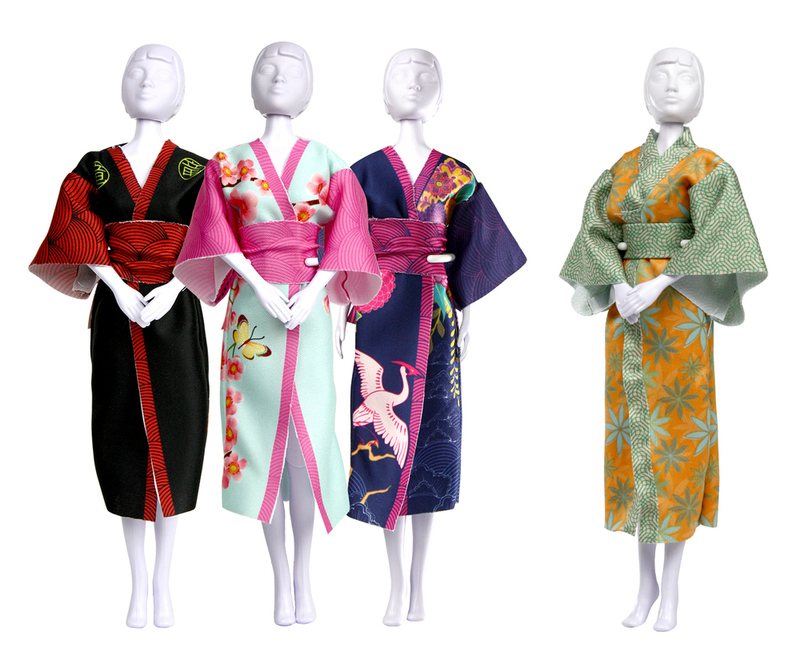 To celebrate this beautiful spring we're having, with the first budding leaves and the blossoms finally blooming, we're showing you how to make this gorgeous DressYourDoll Kimono! This is a product that's available in three designs in our shop, but you can just as easily make it yourself using our Fabric sets! Now, we know it looks like a very daunting design — But don't worry, it's actually so easy if you know the steps! Let's dive right in! 1 — Start by laying out your pieces. You should have a piece for the back, two front pieces, two sleeves and a band that will be the Obi, the belt. Now take the two front pieces, and place them, color in the inside, on the back piece. 2 — Pin together, and sew the two upper seams as shown in 2. 3 — Now fold the fabric open along the seams you've just sewn, so upwards. 4 — Now, put the sleeves on the main piece, making sure the bits marked in the image line up. Again, colors on the inside! 5 — Pin together and sew along the colored lines! 6 — Fold the sewn sleeves open along the seams, so to the side. 7 — Now, close the dress, by folding the pattern downward on itself, colors on the inside. Make sure the dotted lines match up! 8 — Now pin it together and sew the remaining seams! This means, the bottom seams of the sleeves and the side seams of the kimono. 9 — Turn the pattern inside out... And ta-da! Your very first, hand-made kimono! 10 — No kimono is complete without the Obi, a kind of belt. Usually on a woman it can measure more than 14ft or 450cm! Of course, we use a slightly shorter sash, but it still looks gorgeous. Tie it in a knot or a bow around the waist to give a finishing touch to your kimono. There you have it! Wasn't that way easier than you expected? Are you just itching to get started on this gorgeous design? Patterns and fabrics of these items were used!